We pay top $$$$ for ALL coins, currency, precious metals, gold and sterling silver jewelry. There is never any pressure to sell, and we offer FREE appraisals. 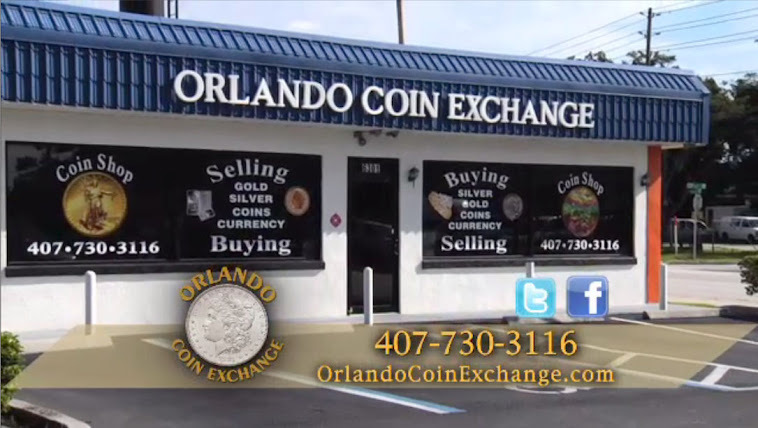 Orlando Coin Exchange is located on South Orange Ave. just south of downtown Orlando. With nearly four decades of experience in trading Rare Coins, Currency, and Precious Metals, we are the authority and you'll get top dollar for your Gold, Silver, Precious Metals, Jewelry, Rare Coins, and Currency. Precious Metals are a vital safety net for many Americans when hard times hit. If you're looking to sell your Gold, Silver, or Jewelry then come in and see Jason & Jerry. Looking to buy? We have a huge selection of Rare Coins and Paper Currency as well as Gold, Silver, and other Precious Metals. We are family friendly, owned and operated. Bring the kids with you, they can look through the kid's coin bin to start their own coin collection! ORLANDO COIN EXCHANGE, 6301 SOUTH ORANGE AVENUE, SOUTH OF DOWNTOWN ORLANDO.